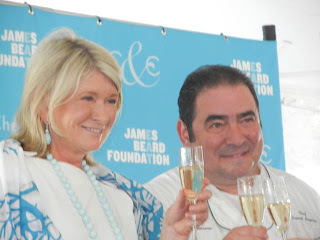 Saturday’s unbelievably hot weather didn’t spoil our first time visit to the James Beard Foundation’s annual Chefs and Champagne fundraiser at Wolffer Winery and Estates in Sagaponack. Full from all the wonderful food, and amazingly overheated, Henry and I lasted about an hour and a half before we sought out cooler places. The media buzzed, as Celebrity Chef Emeril Lagasse was honored and shared the stage with past honoree, the grand dame herself, Martha Stewart. Coincidently, Henry and I shared the same strategy for navigating the food and drink and focused mostly on lighter fare, seafood and vegetables, and mostly skipped the awesome looking lamb, beef, pork and array of sweets. I alternated between refreshing sips of Wolffer Rose and large gulps of cold bottled water. There was no way you could sample bites from every one of the 40-plus chef stations (or all the wines and champagnes). My first and last tasting station visit was Emeril Lagasse's Delmonico Restaurant in New Orleans for their delicious gulf shrimp in traditional remoulade sauce. A truly rare event -- Henry, my normally calm, cool and collected husband was absolutely star-struck by Emeril and made sure to let him know how much he admires all he does for New Orleans restaurants and preserving NOLA's food culture (Henry's from NOLA). We savored every bite. Hands down, my favorite taste was from a Jacksonville, Florida chef who drove 38 hours round trip for the star-studded Hamptons event. Chef Richard Grenamyer (Blue Fish Restaurant and Oyster Bar) served Soy and Ginger–Glazed and Black and White Sesame–Crusted Tuna and Soba Noodles with Wakame and Wasabi Cream. Henry brought me a taste to share, and then I went back for seconds, then thirds. "The key to making this dish", Grenamyer explained, "is half and half for a smooth wasabi cream". The Wall Street Journal loved Grenamyer's tuna too! 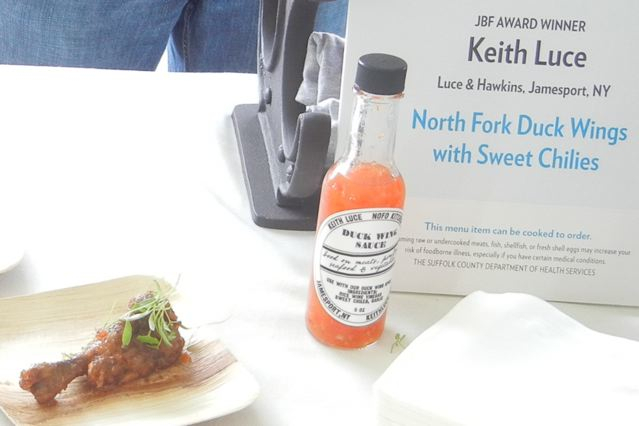 Stephanie Krikorian wrote "His (Grenamyer) Soy and Ginger-Glazed and Black and White Sesame-Crusted Tuna was one of the greatest joys of the event, prompting this reporter to grab a second (okay third) serving of this refreshing plate." I must crack the code on this awesome recipe or, better yet, give chef a call. Other faves included NYC's Marc Forgione's chile lobster with local corn and lemon verbena over Israeli couscous, Kerry Heffernan's corn panna cotta with marjoram and chanterelles, Sara Jenkins' spicy chilled tomato soup with olive oil, whipped goat’s milk, and yogurt, Roberto Deiaco's grilled sea scallops with herbed new potato salad, truffle foam, and truffle shavings and the hyper local balsamic cherry tomatoes with Catapano Dairy (North Fork) farm Feta, Round Swamp (South Fork) aubergine, Satur Farms (North Fork) herbs, and Dakos Elyros olive oil crisps by "the Greek Martha Stewart" Chef Maria Loi. Henry veered from seafood with John Doherty’s angus beef smoked chili served inside a very Flintstones looking bone marrow "dish" and served with a wooden fork. Click here to see more dishes served on the Chefs and Champagne menu.